I have always enjoyed my mom’s cooking and one major reason behind it has been her keeping it healthy. The butter and ghee (clarified butter) is avoided wherever it can be. 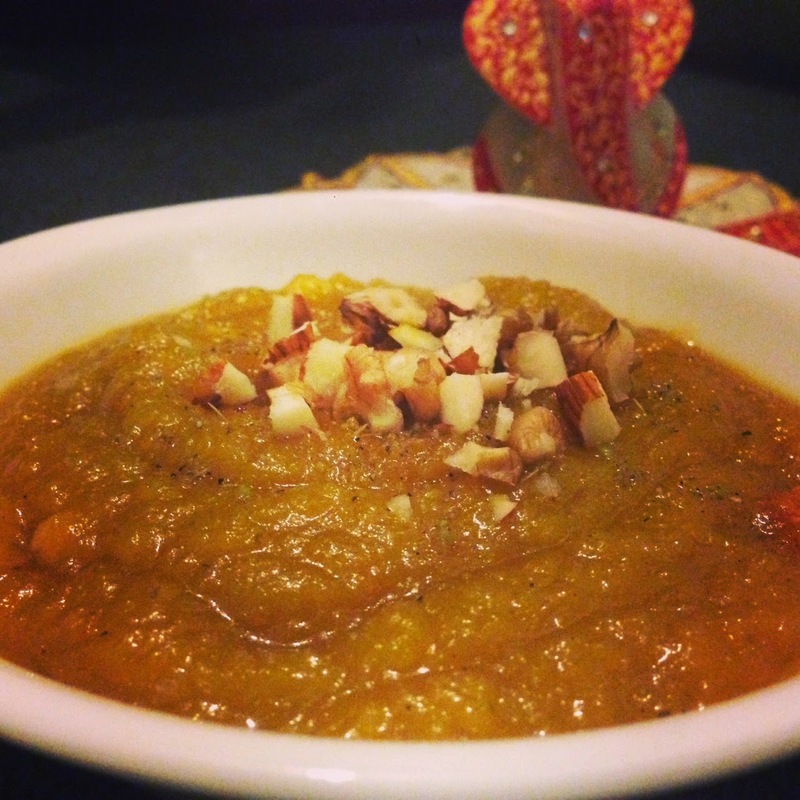 Every navratra before I got married I used to binge on the kaddu ka halwa (close to a pumpkin pudding) she used to make for us. It was extremely plain and simple; no nuts and yet I was in love with that simplicity; the smooth blended texture that used to just melt slowly and give itself away to my taste buds once it touched the tongue. And the best part about it was that it was made in just a spoon and a half of ghee and yet looked and tasted so luxuriously rich. Since I enjoy trying and learning things on my own, I googled for a few recipes and tried making myself some kaddu ka halwa for dinner yesterday. I had asked my house help to cut the pumpkin in small dices. I took a pressure cooker and dropped about a spoon of ghee into it. 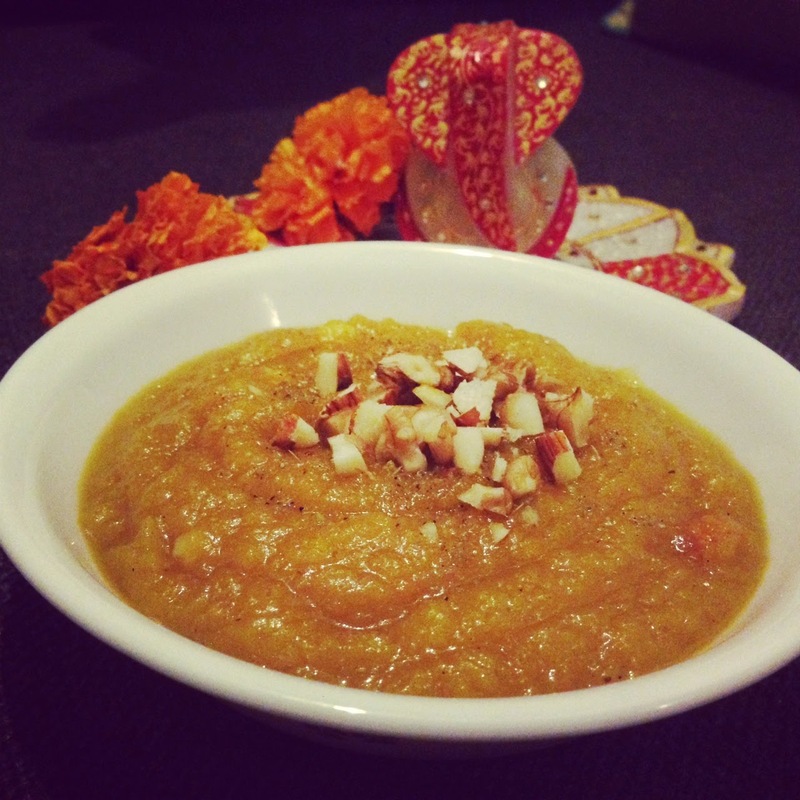 Once the ghee was hot I added the chopped pumpkin. I sautéed the glowing yellow-orange pumpkin dices till they started sweating a little. I then, added very little water with some crushed cardamom seeds. Closing the lid, I left the cooker to whistle. After approximately three to four whistles I switched the flame off and left the cooker to get clear of the steam. Once it was done, I checked if the dices were tender enough to be mashed. And they were. I then mashed the tender dices with a hand blender. The texture looked so silky and creamy. I then put the cooker back on low flame and cooked the pureed pumpkin for a while. Once it was slightly thick I added sugar and some more crushed cardamom powder to it. I kept cooking it till the excess moisture dried away. I then sprinkled in some chopped almonds and walnuts. It was ready to serve! Since I wanted to have it chilled (having it chilled is like binging on a pudding), I let the temperature come down and then had put it in the refrigerator to chill. Everybody loved the sweetness of my genuine endeavour. The texture was just as I like and my favourite walnuts went perfectly well with it. I must confess that my sweet tooth didn’t complain either. Like the Sabudana Kheer , this dessert is also extremely simple to make. All you need is a little patience. Cut the pumpkin into small dices. Heat ghee in the pan and add the pumpkin dices to it. Sauté for 8-9 minutes or till the pumpkin dices start to sweat and reduce in size. Add water and some crushed cardamom seeds leaving a little for later. Cover the cooker and let it whistle 3-4 times. Turn the flame off and let the steam clear. Check the pumpkin, if it is easily mashed with a spoon puree it with a hand blender. If not give another 1 or 2 whistles and then puree it. Cook the pureed pumpkin on low flame till the excess moisture dries away. Add sugar and some more crushed cardamom seeds. Garnish it with chopped nuts.